The Formal Upright or chokkan style is very common and characterized by a singular straight, upright trunk that tapers towards the top. Branches form at orderly intervals and are thicker at the bottom, becoming shorter and finer towards the top. A common style known as the Informal Upright, or moyogi, features a slight curvature in the trunk of the tree, giving its branches a sense of movement. The free-form boughs and trunk lend this bonsai a more relaxed or casual appearance. The Broom style, or hokidachi, is well suited to deciduous trees with leaves. This bonsai is characterized by an upright trunk with multiple fine branches growing upwards to form a leafy ball-shaped crown. The shakan or Slanting style lends itself to coniferous tree species. The tree is grown at a slanting angle, with the first branch pointing opposite the direction of the leaning trunk, to cultivate an element of harmony and balance. Windswept bonsai, also known as fukinagashi, emulate a tree exposed to sustained winds, as might be found on a rocky cliff face. Branches all point in one direction, as if the growing environment bore consistent, strong, directional winds. Deciduous plants bear leaves that are typically shed during the fall (or, in tropical climates, during the dry season), and include trees, shrubs, and herbaceous specimens. After the leaves drop they go into a period of dormancy before a new growth cycle begins in the spring. This is an exotic, tropical tree species millions of years old, native to the islands of the East and South China Seas. While not technically a palm, it bears lush, dark-green palm-like fronds from its rounded, textured trunk. The Sago Palm makes a very interesting and unique ornamental bonsai. Our Golden Gate Ficus features a lovely Informal Upright style bonsai design, with a slight curvature trained into the trunk. 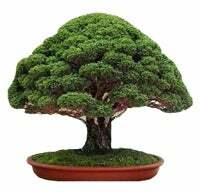 This indoor bonsai's small, spritely leaves offer a lush sense of nature's greenery and a beautiful, sculptural form. The ficus is actually a kind of fig tree; much can be said about this tree's symbolism in the Old Testament bible. The Ginkgo is an ancient tree species dating from the time of the dinosaurs. Their characteristic leaves are unlike any other on earth, with a classic bi-lobed fan-shape and a brilliant green color. In the East, it is considered a sacred tree, and a symbol of love. The evergreen plant has leaves that literally stay green in every season. These can be both trees and shrubs types, from conifers with needle-shaped leaves such as pine and junipers, to oak and holly trees. Most evergreen bonsai require a winter dormancy rest period to keep them healthy. The juniper is one of the most popular and common bonsai species. It has a lightly scented, dense needle foliage and a trunk that can be trained into expressive, sculptural forms. This craggy evergreen lends itself to perfect miniaturization, making it a beautiful symbol of nature's indomitable spirit and strength. This pine species is a naturally occurring dwarf pine, featuring short, deep-green needles. In its normal habitat it grows in high mountain regions, making it an exceptionally hardy, cold-winter tolerant outdoor bonsai specimen. This general sturdiness and adaptability to harsh conditions has made the pine a symbol of immortality and longevity. Podocarpus are relatives of the decorative yew tree and evergreen pine, with conifer-type short, flattened needles creating a delightful fringe-like appearance. Ours is an Asian varietal sculpted in the Informal Upright style of bonsai, featuring a gently curved trunk. Both the yew and the pine are symbols of longevity. Flowering bonsai trees come in many different varieties and produce lovely blossoms, making them a favorite ornamental. Since the art of bonsai recreates the essence of a plant in miniature, flowering specimens are highly prized for the beauty, color, and scent they bring to outdoor and indoor landscapes. Gardenias possess sensuous white flowers with a luxurious suede-like texture. Its glossy dark-green foliage creates a beautiful contrast to its pure white blossoms. The flower's legendary scent has been in prominent use for centuries to create luxurious perfumes. Azaleas are one of the most popular bonsai due to their generous production of bright pink blossoms and the length of their bloom time. But their beautiful green leaves will make a lush and pleasing outdoor ornamentation, even without the blossoming. One of the most elegant flowering bonsai specimens is the Camellia. They produce their characteristic showy pink blossoms late fall through early spring. Because they bring bright spots of light and color to winter's gray months, Camellias are one of the most popular bonsai. Some of the most appealing bonsai are those that bear fruit. Many varieties of fruit can be exquisitely cultivated into a sculpted miniature size. And fruiting bonsai will give two seasons of delight: first when it flowers, and again as it yields fruit. They're also a special educational treat for children, who can take interest in watching their full growing cycle. The pomegranate is a lovely deciduous plant bearing gorgeous, vibrant-red flowers that ripen into a delectable, exotic fruit. It was renown throughout ancient Persia and Rome for its beauty as well as its medicinal and culinary purposes. And with its abundance of seeds, it's easy to see how it became a traditional symbol of fertility and prosperity. Citrus oranges trees are a delight to behold: lovely green leaves frame tiny, waxy, white flowers which develop an intoxicating fragrance. After blooming, the bonsai will fruit with small oranges. A seasoned vine will bear fruit: our lovely Sonoma Valley Grape Vine bonsai bears tiny, cabernet grape clusters. Fruiting bonsai, like this vine, are happiest in full sun sites. Watch it flower in spring, and shed its leaves late in the fall. With so many different styles, types, and species to choose from, finding the right bonsai to reflect your personal style and taste can become a pleasant journey of learning and discovery. We invite you to further explore our beautiful gallery of artisanal bonsai.